When determining which investments to make in their technology infrastructure, businesses sometimes choose to make no changes at all. While this decision avoids short-term costs and business disruption, it means the risk of reliance on obsolete technology. The cost of doing nothing is expensive in the long term. 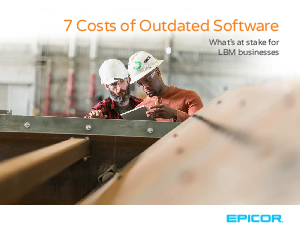 This eBook outlines exactly what is at stake for LBM businesses that wait to adopt modern technology. Download and learn how much your old system is costing your business. You’ll understand how an up-to-date solution like Epicor Bistrack helps build a path toward increased sales and profits.